I do not have a green thumb. That’s what I tried to explain to my mom when she offered me a piece of her plant to grow in my apartment. A plant, I should mention, she’s had since I was a child. 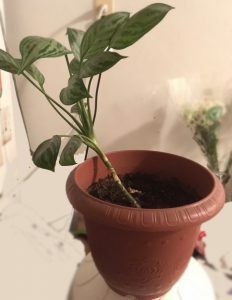 A plant that survived countless moves, moods, environments, and bouts of neglect. Surely, this plant would not live to tell its tale should it come live with me. But Mami insisted, and I find it hard to say no to her, so I took the plant. And it has thrived, in the WORST conditions. I over/under water it, barely provide sunshine, haven’t changed the the pot since day one, and my apartment is either 1000 degrees or below zero. It’s snapped in two and numerous leaves have turned yellow on occasion. But still, it thrives. Why am I telling you this? Because I’ve learned some things from this plant that I can extrapolate to my life, and maybe you can use it, too. 1. You can stand up after a fall. 2. You can weather anything. 3. The thing you think is breaking you, really is giving you a chance to be reborn. 4. In life, with life, anything is possible. 5. Nature finds a way (which is really a lesson from Jurassic Park, but living with this plant really brought the point home). That said, let me get back to work. Oh yeah, and let me water this poor plant, too!